All Studio Bars are created equally! Fitness-Mad Studio bars are made with a solid iron core that is welded in place so it will not rattle, the outer steel tube is powder coated to ensure no rust ingress. The bar is the covered with "elephant skin NBR" to offer the prefect mix of comfort, grip and importantly durability. 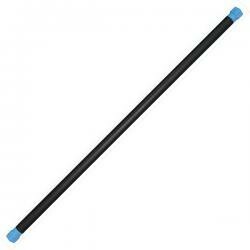 The rubber bar ends both protect the floor and are designed to prevent the bar from rolling away.